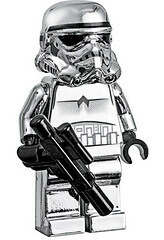 LEGO Silver Star Wars Storm Trooper. Say that 10 times really fast! This popped up this morning on the Toys R Us website – if you purchase a LEGO Star Wars set of $11.99 or more in value, you get this Storm Trooper (or stormtrooper) free. It looks like you can purchase it as well, for $2.99, which seems a little odd. It is listed as sold out, but if they were actually offering these for sale, people would just go in and pay the $2.99 a piece and throw them up on eBay or BrickLink. My guess is that it needed a price to be in the system and it’s probably only being offered through the stores with the purchase of a LEGO Star Wars set. I could be wrong, and I’ll take a look in a few days and see if they have any available near me. I’m not sure if “4591726” is the actual LEGO # for this minifig or not. That’s what is listed in the Toys R Us system. Update: This is the same silver/chrome minifig being discussed at Brickset. Update #2: I got an email (thanks Ruben) that you could buy them online and that they sold out online sometime around 10:30am (CST) and that he was able to purchase yesterday morning before they sold out. No idea yet on if stores have them in stock, since they are not consider a part of the normal inventory.